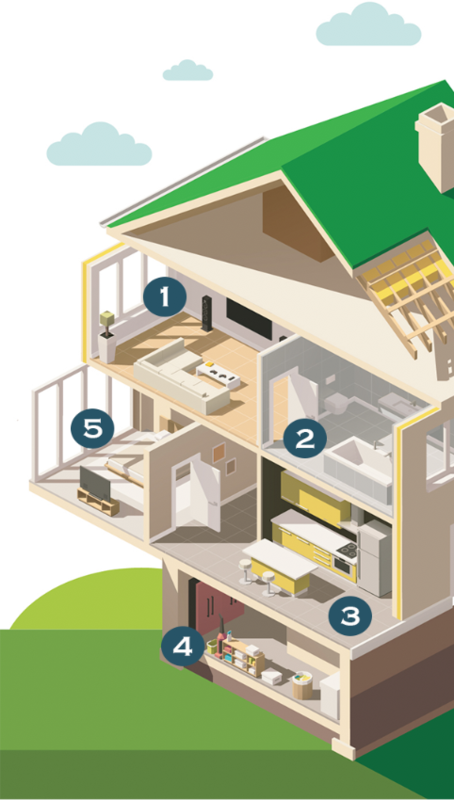 At E3 INNOVATE, we believe a house should be a safe, clean, and comfortable haven to live in. That is why we help families create high performance homes and commit to helping our clients protect their most treasured investment for generations. with Whole Home Solutions from the Experts at E3. Whether you are making upgrades to an existing home, planning a new construction project, or renovating a historic house, E3 provides the expertise to help you create a healthy, comfortable, and efficient space that is resilient to life's unpredicted storms. Safe indoor air quality, continuous comfort, and long-lasting durability can be achieved when a home is designed with an integrated approach. If one or more components gets ignored however, issues can arise that lead to costly and inconvenient repairs, such as humidity problems, mold and mildew growth, radon concerns, and comfort imbalances. That's why E3 takes an integrated whole-home approach with your project. We focus on five pillars of home performance while also addressing the details that make each component work as part of the system. 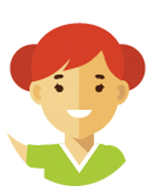 Our strategy helps ensure you get the desired results out of your investment. 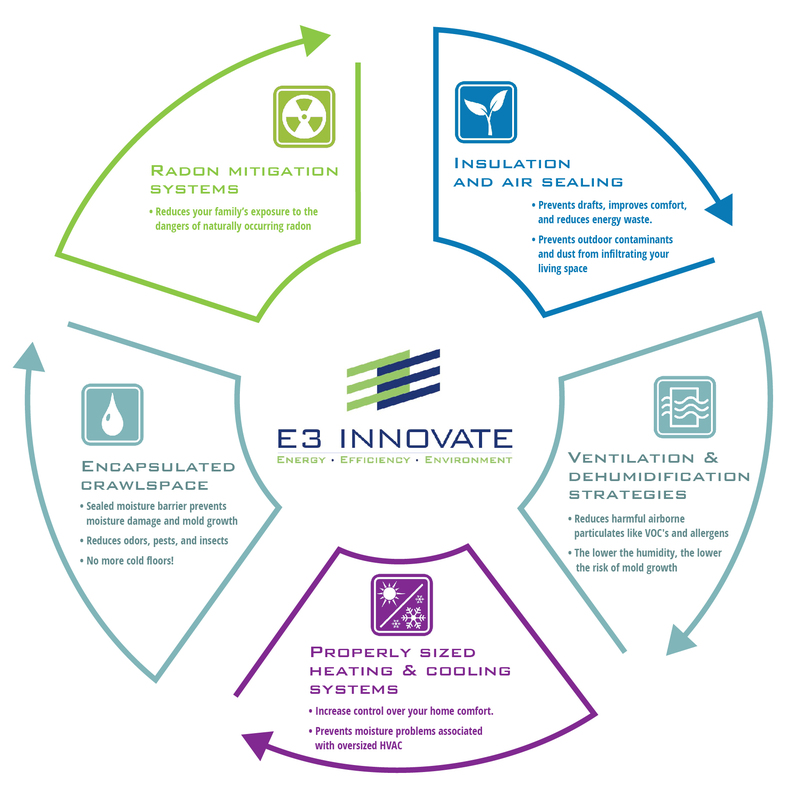 E3 INNOVATE is a whole-home performance company that focuses on integrated, long-term solutions that serve you and your family. Without a whole-home approach, issues can arise that may lead to health concerns, like mold growth, poor ventilation, radon gas infiltration, and poor indoor air quality. Issues like these can affect the health of your entire family. Symptoms may vary from person to person, so it's important to know about the many symptoms associated with poor home health. I think my house is making me sick. I get headaches and feel dizzy but it all goes away when I leave the house. I have a lot of moisture in my crawlspace from the recent rain and it’s messing up my floors! Which Symptoms are you Seeing in Your Home? The first clue that a home has a performance issues is when symptoms appear. This happens when the house is constructed and maintained with a piecemeal appoach. Visible mold growth in bathrooms, on window sills, on air registers, etc. Air feels damp or clammy, even when the air conditioning is running.